WHAT IS IT? The Model HS is a helical shaped stand alone brush assembly for use on conveyor belts to remove excess buildup and material carryback. The brush can be mounted and driven using various methods, including from the head pulley using a sheave/pulley & belt arrangement. In addition to cleaning conveyor belts, the Model HS has been used to clean sawdust from plywood sheeting, remove excess fiber from fiberglass boards, remove coffee fines from roaster drums, and excess concrete from newly formed concrete bricks and blocks. WHY IS IT NECESSARY? The Model HS allows the user to customize the mounting and drive arrangement to accommodate confined spaces or special drive requirements. Sample model is HS(bristle diameter)(bristle material)(belt width), example HS040N36. Sample model is HB(bristle diameter)(bristle material)(belt width), example HB040N36. The bristle strip material is either nylon, polypropylene, or oil tempered wire. Nylon and polypropylene bristles are available in 0.040, 0.028, or 0.014 bristle diameters. Wire is only available in 0.010 bristle diameter. Typical bristle trim length is 3" long. Other trim lengths available upon request. The hubs are typically a polyester powder-coated gray iron with zinc chromate plated clip assemblies. Two set screws per hub. 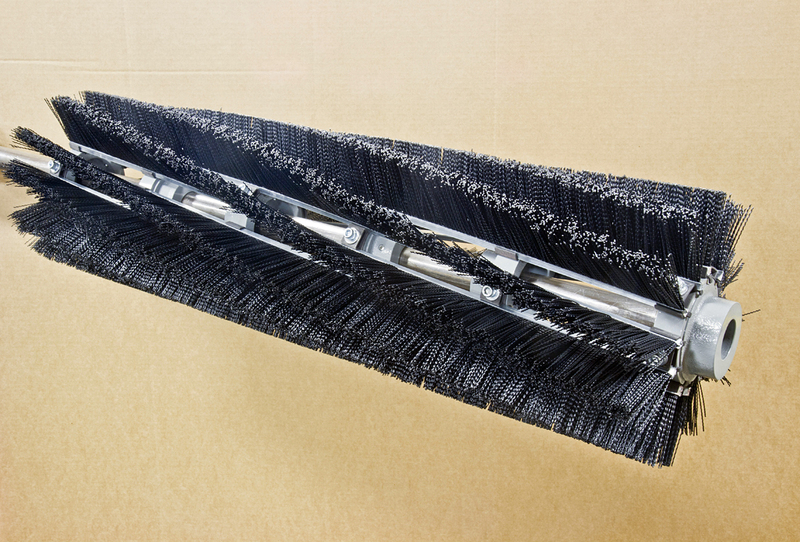 The brush is helical shaped to ease onto the belt and open faced to reduce clogging or plugging. The unit is mounted on the conveyor by either a 1/7/16" or 1-15/16" diameter shaft and 2 pillow blocks. Typical brush diameter is 10". Other diameters available upon request. Special bristle materials available upon request. Special bore hubs available upon request. The operating temperature range is -40ºF to 180ºF (-40ºC to 82ºC) for nylon and polypropylene bristles. Brush widths of 72" or less will be supplied as a single brush. Brush widths of 73" to 108" will consist of two brushes (end to end).